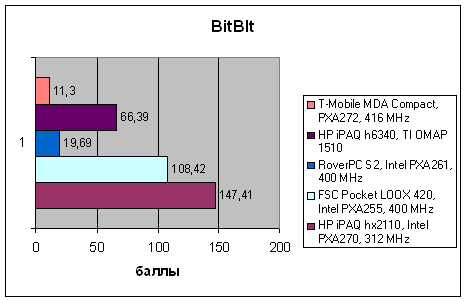 Pocket PC communicators have been always considered devices of much controversy, despite the considerable advantages and progressive nature of this platform. It initially implied fixed display resolution and proportions. Previous generation technologies allowed to manufacture rather large (3.5” and larger) TFT displays of a standard resolution (320x240 pixels), which resulted in the increased width of the devices. As a result, large communicators were very discomfortable to use. Mandatory hands-free usage didn't and won't do for most users. 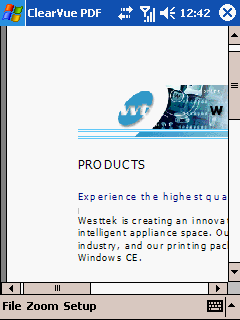 So these dimensions and display proportions limited the improvement of Pocket PC communicator ergonomics. Changes for the better started when there appeared displays with reduced pixel size (or, equivalently increased physical resolution). 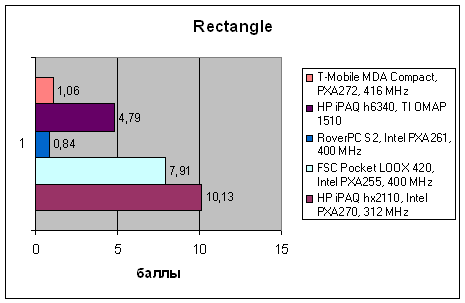 This technology allowed displays with the standard Pocket PC resolution, but with their diagonal reduced to 2.8”. The first generation of such displays offered low technical characteristics (STN, 4096 colors), but they opened up an opportunity to make communicators of a totally new, more compact and convenient form factor. We tested one of the first devices of this kind some time ago, E-Ten P300. Our impressions were mostly positive, though we noted an insufficiently good image quality. But it was evident that the appearance of such dimensions, but with better technical characteristics, would allow more successful communicators. The next step in the development of compact Pocket PC communicators was done by HTC. This company is currently the leading designer of communicators and smartphones on Microsoft platforms. You will not see these products on sale under their own trademark. They are shipped by OEM contracts to companies specializing in sales of such products (two of them, i-Mate and Qtek, are well known brands, their range of products consists completely of HTC products) as well as to large European mobile operators (T-Mobile, Orange). The compact communicator HTC Magician with a 2.8” display is the latest device from this company (a serial-production model of course, we don't take into account the MDA IV platform, which has not yet entered the market). This reference design is used for such products as i-Mate JAM, Qtek s100, T-Mobile MDA Compact in a practically unchanged form. We shall use the latter model to analyze Magician. MDA Compact is a product that comes under the trademark of the Western European operator T-Mobile, thus it's intended for the countries where this network is available. So this product is not officially shipped to Russia and CIS countries. However, such products are usually not SIM-blocked, so you can use SIM cards of any mobile operator in such a device and no software intrusion is necessary. So the only problem that may bother a T-Mobile MDA Compact user is a warranty, which is totally up to a vendor. 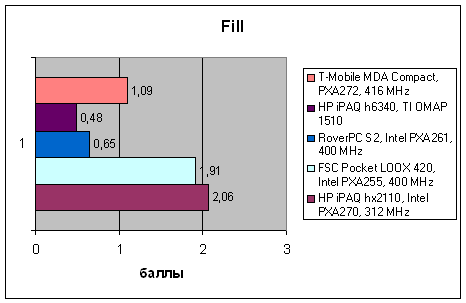 According to its title, T-Mobile MDA Compact is a very compact device for a Pocket PC communicator or a handheld. It's significantly smaller than typical PDAs, it's approximately as high as a modern handset and just a tad wider. Rectangular housing with rounded edges is convenient to hold in your hand. 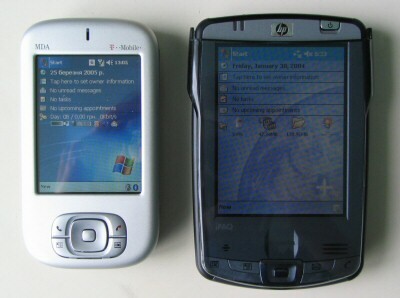 There is practically no impression that the communicator is too wide as it happens with almost all Pocket PC devices. The front panel and the battery cover are stamped from an aluminium sheet and have a natural metal color. The upper permanent panel on the rear is made of plastic (it covers radio module antennas), it's painted silver to match metallic elements. The plastic chassis protruding at the sides have black finned surface, which contributes to a firmer grip – it's very helpful because aluminium is rather slippery. What is really good in HTC Magician is its assemblage quality. The device is assembled well, the seams are almost unnoticeable, which gives it an "expensive" air and makes it more pleasant to use. Except for the display, the front panel houses only four buttons and a five-way joystick. 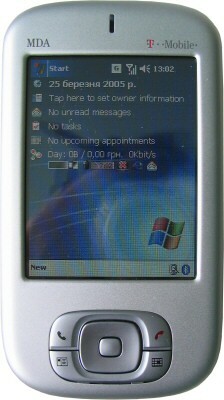 Button functions are typical for a Pocket PC communicator: two of them serve to accept and reject calls, the other ones are used to access the contact list and the calendar. The buttons are rather large, the stroke and tightness of buttons are optimal and nice to work with. The left side of the handheld holds two buttons and a three-way joystick. The mic button performs two functions – a short press activates voice dialing, press-and-hold gives access to the voice recording interface. The second button is used to enter the camera mode. It's not difficult to guess that the joystick serves as a volume control. The right side houses the on/off button, a stylus bay, and an IrDa port (at the bottom). There is only an SDIO slot with a stub on top. On the bottom there is a Mini USB connector and a micro-jack (2.5mm) to connect headphones. The bundle of MDA Compact includes the communicator itself, a charger, a data cable (Mini USB interface), stereo hands-free, an extra stylus, a fabric case to carry the device at your belt, documentation, CD with Pocket Outlook and ActiveSync (a standard set for Pocket PC), as well as a CD with Paragon localization and a booklet about it. As you can see, the bundle is rather rich and includes almost all accessories you may initially need. The localization CD in the bundle of an unofficially shipped product is a reproach to a number of well-known dealers, who officially sell smartphones, communicators, and PDAs in Russia and don't even bother to take care of localization or bundle them with "disposable" localization without an installation package (Hello, MPx200). Cables for MDA Compact, as we have already mentioned, include only a Mini USB data cable, the bundle does not include a cradle. The Mini USB connector allows to use cables from digital cameras, MP3 players, etc. So you most likely won't have to buy additional cables to synchronize the device with several computers. Moreover, the communicator may be charged from a USB bus, so you probably won't have to worry about charging the device at all, if you operate in the always-connected mode. The stylus is small, light-weight, and composite (the body is metal, while the tip and the cap are plastic). The cap completely blends with the side profile near the bay. That's why it's will be difficult at first to find the stylus, but you'll have no problems taking it out. The stylus may seem not very convenient due to its small dimensions, but it's impossible to accommodate a larger stylus in this device. The display has a standard 320x240 resolution, but it's diagonal is reduced to 2.8”. It's a TFT display supporting 65 536 colors – standard characteristics for Pocket PC displays. Reduced dimensions with preserved resolution expectedly mean a sharper and less grainy image, but the MDA Compact display is outperformed in these parameters by VGA 3.8–4” displays. 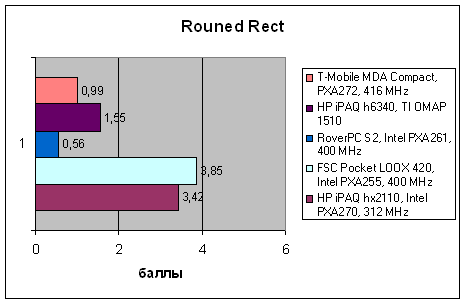 What concerns brightness, contrast, saturation, and color balance of the display, these parameters are little different from regular Pocket PC panels, that is they are on a good level. The touch screen is not so responsive as in most Pocket PC models, it requires more pressure to respond. That's why the chances to scratch the display are noticeably higher than in other handhelds, so we recommend using a screen protector. MDA Compact is equipped with a 1200 mAh lithium-ion battery. It's installed into a battery bay at the back of the device, which is covered by a sliding metal lid. The communicator has a mechanical lid detector, so the device will turn off automatically as soon as you open it. Even a novice will have no problems with opening and closing the lid as well as with removing the battery. Hardware configuration. 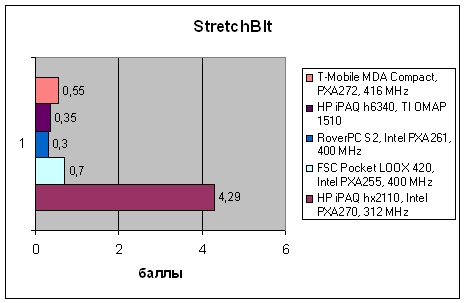 T-Mobile MDA Compact is based on Intel PXA272 416 MHz, it's equipped with 64MB of RAM and 64MB of flash ROM. 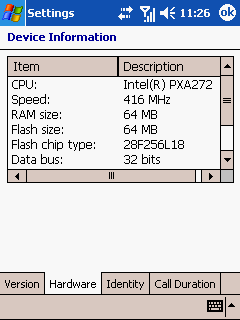 7.6MB of the Flash ROM is allocated for user data (built-in flash drive). The device has only one expansion slot – SDIO, which allows to use SD, MMC cards and SD peripheral devices. Wireless interfaces include IrDA and Bluetooth, wire interfaces – USB. USB can be used to transfer data as well as to charge the battery. It's a permanent configuration for HTC Magician, it's typical of all devices based on this platform. 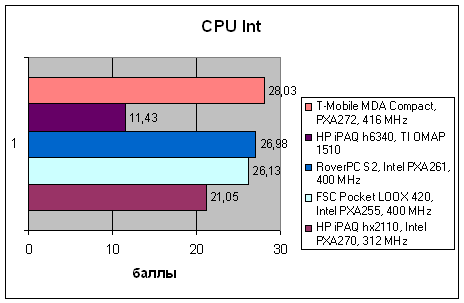 It's a typical configuration of a low middle-end Pocket PC – a 400MHz processor, one expansion slot and one radio interface. The only unusual thing is the small size of the built-in flash drive – just 7.6MB, while a Pocket PC with the same flash ROM capacity allocates 20-22MB for a flash drive. This difference can be easily explained by a lot of programs written to the Flash ROM, which will be installed automatically when you turn on the communicator for the first time. They take up a lion's share of Flash ROM. 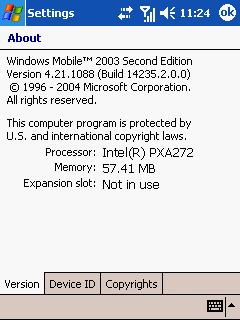 T-Mobile MDA Compact operates under Windows Mobile 2003 SE Phone Edition. 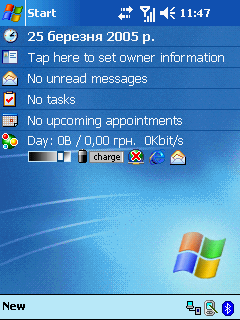 It's a standard Pocket PC OS of the latest version, supplemented by a standard Microsoft utility to manage voice communications. A regular set of Microsoft applets in this model is supplemented by a rich set of various programs from third party developers. The main screen of the communicator is not very different from a usual Today screen of a Pocket PC, but the difference still exists. The upper line of the interface also contains indicators for a GSM signal level and a GPRS status, a usual thing for a Phone Edition. The bottom line contains an additional icon. A click on this icon will rotate the image from portrait to landscape orientation and back, turned left and right relative to the communicator. But the most noticeable difference is an additional panel on Today screen, which contains: GPRS traffic counter, display brightness control, battery charge indicator (estimated battery life), as well as icons to launch Internet Explorer and message utilities. 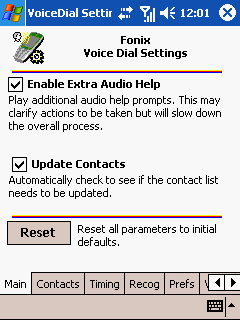 Voice dialing is implemented via Fonix Voice Apps. 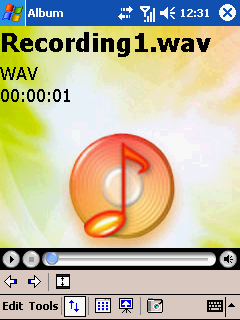 This program is launched when you press the voice recorder button. MDA Compact designers have tried to set up a universal voice dialing system, which allows to work with the advanced addressbook (where each contact may have several phone numbers) and call the phone numbers that are not stored in communicator's memory (dialing them number by number). The program is based on the step-by-step principle, it's sort of a voice dial wizard. You can get voice prompts at each step, which allows blindfold interaction with the system – it's important when you use hands-free. The order of user actions is as follows. 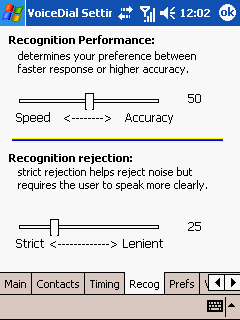 Having launched the program with the button or from the menu, a user is prompted to perform the next step — to pronounce one of the function words. It may be calling a contact by a voice command (Call), calling a contact from an addressbook at home or at work (Call at home, Call at work), calling a mobile or pager number of a contact (Call mobile, Call pager), calling a custom number by digits (Dial by numbers) or quitting the program (Goodbye). When you call a contact, the program pronounces his/her name and requests a confirmation (Is this correct?). If the voice command is detected correctly, you should say Yes to proceed to dialing. Otherwise you should say No and return to the previous step. So, designers have created a voice dialing system, which does not require preliminary training and works with the addressbook of the communicator. The idea is good, the implementation is not bad either, but it does not suit well our realia, as usual in such cases. The program practically cannot be used to its full capacity, if contacts are transliterated or typed in Russian. You can either record voice commands for all your important contacts in English, or translate your entire addressbook into English, which may prove problematic just because it contains Russian names and surnames, which are usually spelled and pronounced differently in English. Album is a universal program to browse multimedia files, which is intended as a default program for browsing graphics files, playing video clips and sounds in various formats. This utility is really universal and convenient, so it will be more than enough for the first time. Later on you may install specialized, more functional applications for movies and mp3. 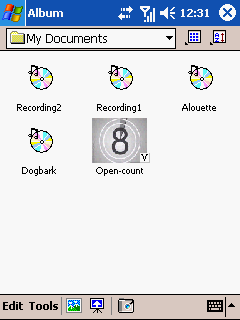 Album does not replace Windows Media Player, both utilities are installed in the system. 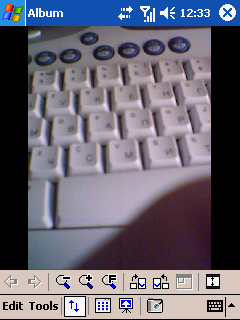 Camera – this utility controls the built-in camera, which can be easily guessed from its title. 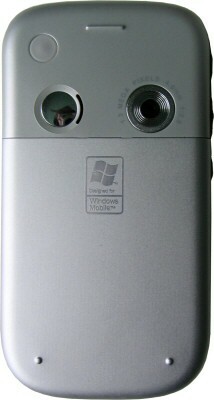 MDA Compact is equipped with a 1.3-MP CMOS camera. The photo quality is average – geometric distortions of the lens are not too high the image is not vignetted, but the image noise grows fast at the decreasing light conditions of a scene. Besides, the CMOS panel requires a rather long exposure, which reduces sharpness in low light scenes – that's the effect of lens motion during the exposure. 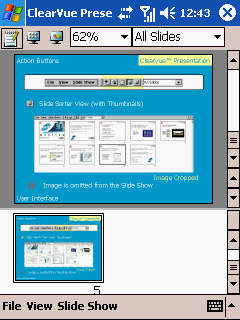 ClearVue PDF and ClearVue PPT are viewers for PDF files and MS Power Point presentations correspondingly. These well-known utilities don't need to be introduced. 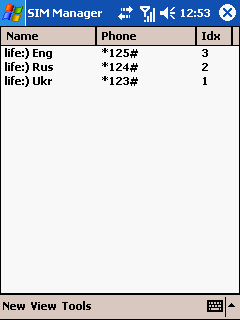 Spb GPRS Monitor is a program that monitors GPRS traffic and displays this data on the communicator's desktop. 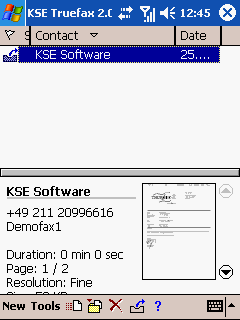 KSE Truefax 2.0 is also a well-known Pocket PC program that manages faxes. MIDlet Manager. 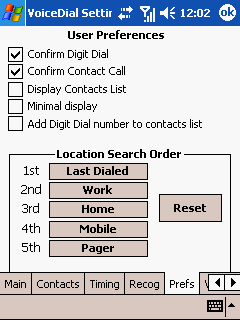 As any handset, Pocket PC communicators must support Java midlets, this application organizes a Java machine. It's hard to say who may need Java applications on a device that have a lot of excellent applications, which use its features to full extent. But still, MDA Compact supports Java, think of it as a decency, even if it's practically useless. Photo Contacts – this program allows to assign photos, which will be displayed at an incoming call from the corresponding contact. There is a special camera mode for shooting such photos. 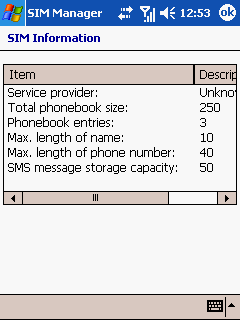 SIM Manager is a standard WM 2003 Phone Edition program, which provides access to the phone book on a SIM card. This program allows to browse the list of contacts, call them, copy records into the memory, create new contacts, and view SIM card properties. The list of features is not rich, but almost all communicators have limited functions for direct operations with SIM cards. xBackup is a program that backs up important data into Flash ROM. Almost all manufacturers install such programs on their communicators and handhelds. 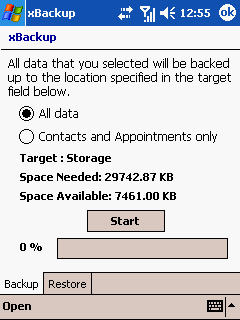 This program allows to back up all the data as well as selected data – contacts and calendar. 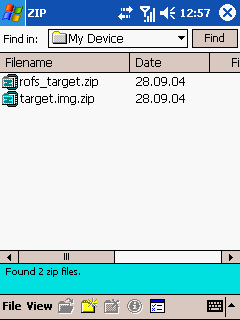 Zip is a simple but very useful utility that works with ZIP archives. There is one peculiarity of Bluetooth in MDA Compact. The built-in adapter uses Microsoft drivers instead of usual WIDCOMM. That's not the most successful solution. Firstly, these drivers are less stable. When you try to enable Bluetooth and connect a device, you will often see a message that the Bluetooth adapter is not available. 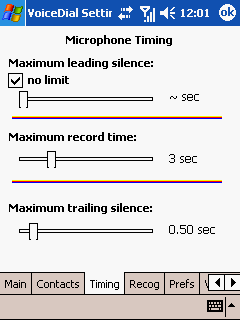 Secondly, functionality of the interface is limited only to hands-free (HFP profile), synchronization via ActiveSync, and wireless headset support (HSP profile only, it was not enough for the normal operation with the Bluetake i-Phono headset). You cannot transfer files via Bluetooth by the OBEX protocol (a generally used practice), it's incompatible with a large list of Bluetooth periphery. Various communities of users and developers try to resolve this problem. In particular, there have been developed methods for replacing Microsoft drivers with similar products from Toshiba, BlueSoleil and WIDCOMM (in all cases you are supposed to install software in a usual Pocket PC way and then manually change some registry entries), but it doesn't solve the problem in most cases – new drivers are not always as stable and universal as they should. 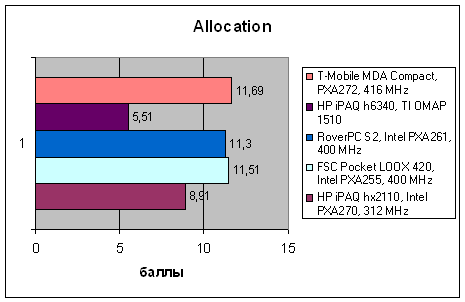 We have compared the VOBenchmark test results of T-Mobile MDA Compact with those of other popular Pocket PC communicators. 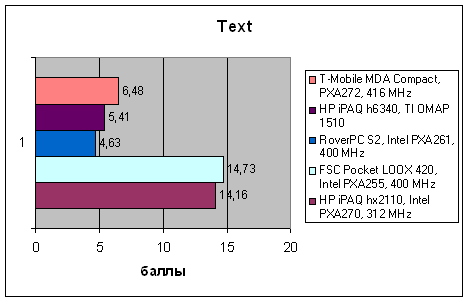 We have also published results of middle end handhelds, which are the closest counterparts of communicators. We can draw mixed conclusions from these results. On the one hand, MDA Compact is fast enough. It outperforms the popular HP iPAQ h6340 in particular. On the other hand, all communicators are significantly outperformed by "pure" handhelds, despite the parity in CPU clocks and memory capacities. This data is confirmed by subjective impressions. MDA Compact performs without critical slow downs, but the user interface is rather "viscous", its reactions to stylus touches are inert. 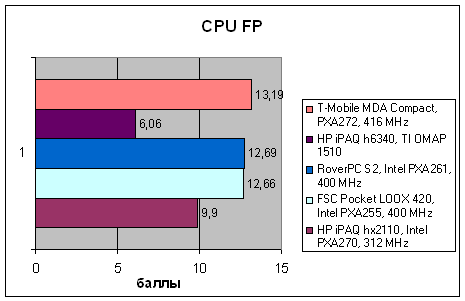 Though the CPU performance is normal (as usual, it's almost proportional to the CPU clock), memory operations are noticeably slower than in regular PDAs (we mean the data transfer rate, not the peak seek rate). Thus, video operations are slower, especially in case of the video buffer fill rate rather than object scaling. According to Spb Benchmark Battery Test, MDA Compact offers 5 hours 46 min of office operations at maximum display brightness (all emitting modules are disabled). It's a good result for a handheld, not all specialized devices can boast of such a battery life. In mixed mode (GSM and Bluetooth are enabled, about 10 minutes of calls every day, moderate use of handheld functions) the device operates 3-3.5 days, which is also good for a communicator. MDA Compact provides a normal reception quality. The device offers stable quality of network. It switches well between the stations, when you move fast. The voice quality is also good, though the sound has a typical "metallic" tone. 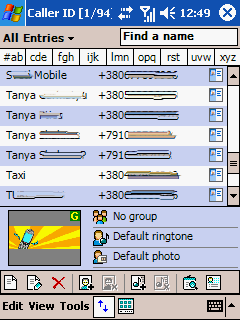 Ring tones are lower than in most phones (especially made in Korea), as is usual among Pocket PC communicators, but they are better than in most other similar devices. The main ring tone format is WAV. A ring tone is supplemented by a good vibra alert. 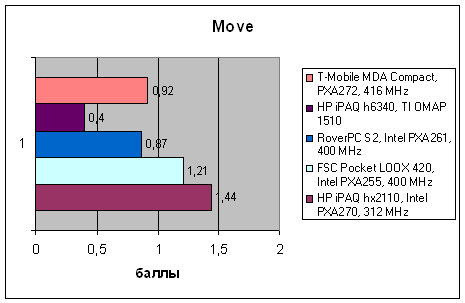 From the functionality point of view, T-Mobile MDA Compact is quite a typical Pocket PC communicator. It's built with standard components, its configuration has practically no peculiarities (in particular, it has no Wi-Fi adapter, which is available in the iPAQ h6340), its built-in camera offers a usual (that is not very high) photo quality. This communicator features a wide range of preinstalled (to be more exact – self-installing after the first startup) software and compact dimensions. MDA Compact feels subjectively different than other communicators due to its compact dimensions, neat assemblage and reliable housing materials. This device is very attractive for most users, it will not be rejected as its competitors for their bulky size (width mainly), cheap materials or primitive design. Its usage also leaves positive impressions, it's a high quality device that offers stable operation and provides business users and enthusiasts with everything (or almost everything) they need. This device has two major drawbacks. 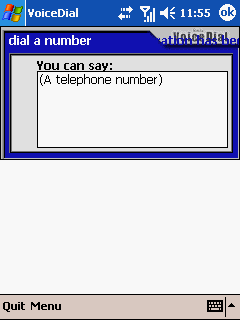 First of all, it's the bad interface of the phone application as in all other Pocket PC communicators. Whatever one may say, most operations with voice dialing or SMS involve two hands and a stylus, which is unacceptable for those who use a phone on the go, or for those with one hand already occupied. Theoretically, the advanced voice dial system may help in this situation, but it's optimized for English users and is absolutely useless in our parts. You may also try to find alternative shells for phone functions. But these projects are on the mediocre level so far, because a good user interface requires tight cooperation between software developers and hardware designers. The second drawback is the problem Bluetooth implementation. Normal operation of this interface is already a must in a business product, so the limited functionality and low software stability somewhat spoil the good impression of this product. Nevertheless, we cannot but admit that the HTC device, codenamed Magician, is the most interesting and probably the most successful version of a Pocket PC communicator so far. The compact dimensions eliminate the problem of uncomfortable phone usage and the high quality of the product attracts potential customers. So, MDA Compact may be a good bargain if you are interested in the Pocket PC platform.